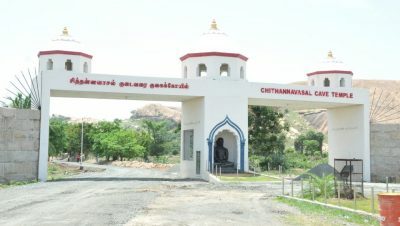 Chithannavasal is a Prominent Tourist Centre of Pudukottai District. It is located on the Annavasal – Pudukottai Road at a distance of 17 km from Pudukottai. 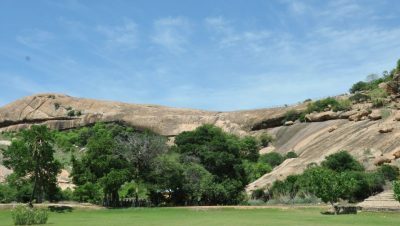 In ancient days the Jain Monks used to live in cave and hillocks so as to perform their ascetic life. They polished the hill for the purpose of poojas and penance in the open shelter. Such a type of Jain temple and Jain beds are found in Sittannavasal and surrounding places. 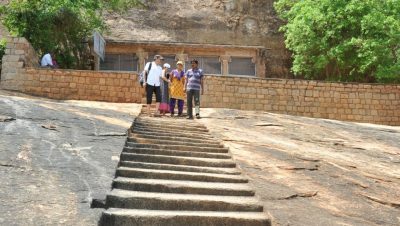 On the Eastern side of the sittannavasal hill have more than 17 beds . The rare Brahmi Tamil script inscriptions are found near the beds. The Jain Beds are collectively Know as Ezhadi pattam . A second century Jain temple in chithannavasal consisted of Mahavir statue on both sides of wall is considered as a ‘Meditation Hall’ or Arivar temple . The ceiling of the Arivar temple are full of Fresco herbal painting dates back to Mahendravarma pallava. Paintings of a royal couple and a lotus tank with marine creatures are notable fresco paintings. These paintings are considered to be the next of Ajantha cave Paintings at Aurangabad. The cave temples are under the control of Archaeological survey of India. The Excavations of Archaeological survey of India reveals that the surroundings of the Chithannavasal have unearthern burial pots. This pots are know as Muthumakkal Thazhi. After death the Jain monks are kept in the pot and buried in the Burial Ground. The District administration together with the financial Assistance of Tourism Department incorporated the Miniature statue park, Children park , dancing fountain and boating jetty near the jain cave Temple. Many foreign and Domestic tourist used to visit this place throughout the year. It ranks first in the tourist arrival statistics of this District.